10 years after Lehman, has US sluggishness just snapped back to normal? A ceasefire or a fight to the finish? When Lehman Brothers collapsed in 2008, the firm was seen as both a victim of circumstance and an architect of its own demise. In playwright Stefano Massini’s The Lehman Trilogy, which was adapted in English by Ben Power, culpability for the Lehman collapse is clear, and it does not belong to Lehman. The fault lies in modernity itself. It’s a compelling take, if one that’s undermined throughout the show as the creators go to great lengths to demonstrate how Lehman created that modernity—or at least, financed it. It’s a fascinating paradox that’s never quite addressed. Massini conceived of the work as a radio play in 2012, then premiered it on stage three years later in Milan, at which point it became a hit. It’s easy to see why. Eight years after the financial crisis, the world was still trying to understand how something as abstract as a mortgage-backed security in the US could result in 28 percent unemployment in Greece. The play’s story—how three Jewish-German immigrants built a brick-and-mortar store that slowly spiraled out of their control, and then their children’s control, and then their grandchildren’s control—was a tidy place to start. Even after it debuted at the Royal National Theatre in London under the direction of Sam Mendes in 2018, the content still felt relatively fresh. The superb trio playing the three Lehmans and their descendants (and their descendants’ wives) certainly help. Simon Russell Beale is one of the world’s greatest Shakespearean actors; Adam Godley, another classically trained alumnus of the Royal Shakespeare Company, is famous for his character work on TV; and Ben Miles, another fixture of the British stage, will likely be recognized by New York audiences for his role as Captain Peter Townsend in The Crown. Now the British production, replete with those same British actors, has arrived at the Park Avenue Armory in New York, with performances running through April 20. The curtain opens onto a glass-and-chrome executive suite whose aesthetic and furnishings will be familiar to anyone who’s ever set foot in a bank or a white shoe law firm. That set stays the same through all three acts. As the brothers build their firm in Alabama, slowly growing Lehman Brothers from a general store in the 1850s to the biggest cotton broker in the South by the 1870s, the props of corporate America serve double, then triple, than quadruple duty: Bankers’ boxes become carriages, a conference table becomes bleachers at a horse race, a lobby becomes a living room. At first, it’s mildly jarring to watch the three actors inhabit so many different characters nearly simultaneously. Thanks to their skill and commitment, the oddity of watching one man swirl his overcoat like a ball dress, then straighten up a half-second later to portray a stiff-backed board member, soon passes without further thought. That level of dialogue might have made sense in an Italian radio play. Presented to a New York audience, it’s a little harder to swallow. During a recent performance, men in beautiful cashmere suits and women in even more beautiful Chanel jackets chit-chatted on bleachers in the Armory’s massive drill hall between acts. This was a group of people, one imagined, who would be able to understand the concept of buying on margin. And yet. The captains of finance are apparently enchanted by the trilogy. Tickets to the show are nearly impossible to get, and the row of chauffeured Mercedes S Class and Bentley sedans waiting outside on the night I attended would imply that word-of-mouth among the Park Avenue set is spreading like wildfire. From a certain angle, it’s easy to see why. This is, after all, the story of how America, and then the world as we know it, got built. Lehman Brothers financed the railroads; the Panama Canal; Sears, Roebuck & Co.; Pan American Airways; and movies that include King Kong and Gone With the Wind. It’s the story of a family that came from nothing to become philanthropists, politicians, and captains of industry. 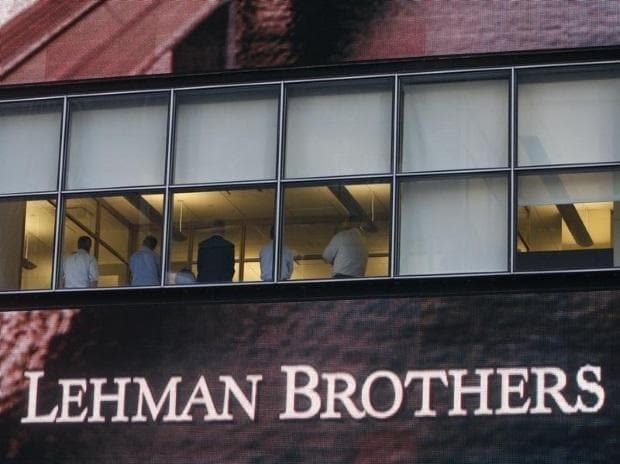 And so, when the end comes for Lehman Brothers—the curtain descends on a last-minute assembly of non-speaking actors in business attire—what’s left isn’t the conference room, the chrome furniture, or even the firm’s name. It’s the legacy of the American Century, a legacy that Lehman built, financed, and then dismantled.